Blu-ray and DVD Review Round-Up: Films by Jean Renoir, Věra Chytilová, Eric Rohmer & more! Blu-ray Review Round-Up: Films by Agnès Varda, Jacques Rivette, Guy Maddin & more! I’m all agog for Gog! Film restorations come in all shapes and sizes. The restoration of Gog (1954), an obscure science fiction thriller shot in Natural Vision 3-D might not sound like much, but in its own way it’s as monumental as the restorations/reconstructions of such unimpeachable classics as Abel Gance’s Napoleon (1927), George Cukor’s A Star Is Born (1954), and David Lean’s Lawrence of Arabia (1962). This is, of course, not to say Gog is as on the same artistic plane or as culturally significant as those movies but, when you boil it down, all movies, regardless of merit, deserve to be preserved and made available in a form as close as possible to the filmmakers’ original intentions, what audiences experienced in the best venues when they were new. Gog is an unusual, nearly unique relic from its era and of its genre. The ‘50s sci-fi boom was still feeling its way when Gog was made. As Bill Warren notes in his essential examination of the genre at this time, Keep Watching the Skies!, the first half of the decade was dominated by mix of relatively adult big studio films produced with “nervous ‘A’” budgets (The Thing, The Day the Earth Stood Still, When Worlds Collide), and smaller but still ambitious, often independent productions (Rocketship X-M, Destination Moon), though there were from the beginning even cheaper exploitation pictures targeting less demanding audiences (Flight to Mars, Cat-Women of the Moon). Generally though, most of these sci-fi films from the first half of the ’50 were movies made for grownups, and not almost exclusively children and teenagers. Gog, despite all its neat-o gadgetry, was a rare venture into true science fiction, not the science fantasy that makes up nearly all of what today is regarded as sci-fi cinema and TV. Producer George Pal got the ball rolling with Destination Moon (1950), a sincere attempt to realistically, plausibly dramatize what an expedition to the moon might actually be like, based on the science of the time. Though critically and commercially successful, it didn’t spur like-minded films. Gog, along with the other two, vaguely related Ivan Tors-produced features that preceded it, The Magnetic Monster (1953) and Riders to the Stars (1954), were exceptions. 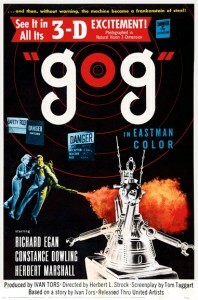 Gog in particular serves as a prototype for the tiny handful of hard-science science fiction thrillers that followed, particularly John Sturges’s The Satan Bug (1965) and Robert Wise’s The Andromeda Strain (1971), movies in which real and theoretical science actually play an important role in their stories. In color and 1.66:1 widescreen as well as 3-D, Gog had the misfortune of bad timing, released as it was after the vogue for 3-D had ended, and CinemaScope’s wide screen and stereophonic sound had won that decade’s great “format war.” Despite its impressive 3-D cinematography, Gog is understood to have played in 3-D in just a handful of movie theaters in Los Angeles; the rest of the country could see it only “flat,” in two dimensions. Later, it was sold to television but, even worse, these 16mm prints were in black-and-white. The “left eye” camera negative was mislaid and for decades the 3-D Gog was presumed lost forever. Indefatigable 3-D enthusiast, researcher, and historian Bob Furmanek, founder of the 3-D Film Archive, located a faded Pathé color 35mm release print of the “left eye” in 2001, which was eventually paired with less problematic right eye film elements provided by Gog’s current owners, MGM, and exhibited at a 3-D festival in Los Angeles some years back. This led to a painstaking restoration of Gog culminating with its Kino Lober Blu-ray release, and the results are stupendous. Unless you were living in Southern California 62 years ago, this is your first opportunity to see Gog as originally intended. Though it has been shown flat on television, released as a (again flat) video-on-demand DVD, and even sold in an awful, faux 3-D DVD release from bootleg video dealers, this new Blu-ray not only presents Gog as it was meant to be seen, but the picture’s genuine merits are much more readily apparent. Like The Magnetic Monster and Riders to the Stars, Gog concerns the OSI, the “Office of Scientific Investigation.” In this case, OSI security agent David Sheppard (Richard Egan) is assigned to look into a series of baffling, gruesome murders and acts of sabotage being committed at an underground, multi-level laboratory beneath the New Mexico desert where a space station is being planned. Joanna Merritt (Constance Dowling, Mrs. Ivan Tors) is another OSI already working undercover at the facility, and she and laboratory supervisor Dr. Van Ness (Herbert Marshall) give Sheppard the grand tour of the gadget-filled place. Most of the gadgets, activated by unseen operators, are behind the deaths. Dr. Hubertus (Michael Fox), for instance, is frozen to death in his own deep-freeze chamber where he’s been conducting cryo-hibernation experiments, and grimly transformed into a veritable block of ice before tipping over and literally shattering like glass. Another scientist is nearly burned to a crisp by her own heat ray, which through a series of mirrors taps into the sun’s rays. Hungarian-born Ivan Tors (Iván Törzs) had a long film and television career in which he became particularly associated with fact-based science fiction, marine stories, animal-centric shows, or some combination of two or more of these elements. Among his credits: the TV series Science Fiction Theatre, Sea Hunt, Flipper, and Gentle Ben, and the movies Clarence the Cross-Eyed Lion and Around the World Under the Sea. His company also did the underwater second-unit work for the James Bond blockbuster Thunderball. Tors’s sci-fi projects are usually regarded as sincere but tame, with an overemphasis on technology and verisimilitude at the expense of drama. That’s true to some extent with Gog, which at times resembles an elementary school trip to the Science Center. And yet, despite a sluggish second act, it more than compensates with several particularly gruesome opening murders and an action-packed climax. What’s remarkable in watching Gog now is to see just how many of these then not-quite fanciful scientific concepts and innovations have since come to pass, and in many cases greatly miniaturized and improved upon far beyond what seem remotely possible at the time. Equally fascinating is how Gog, clunky though it may be, equally accurately anticipates the cinematic future. The laboratory is a ‘50s version of the uncannily similar underground labs featured in The Satan Bug and especially The Andromeda Strain, while Gog and Magog are like the grandparents of Huey, Dewey, and Louie, the robot drones from Silent Running (1972), themselves distant cousins of R2-D2. Today we take automatic sliding doors for granted, but Gog may have been their first onscreen introduction in a science fiction film, more than ten years before they wowed audiences on Star Trek. The restoration of Gog is almost miraculous yet exactly the kind of thing that should be commonplace instead of an anomaly. Essentially: MGM owns the films as part of its United Artists catalog but their holdings included only film elements for the “right eye” half of the 3-D version. When they licensed the title to Kino Lorber, the 3-D Film Archive offered their left-eye elements along with a bid to restore the picture to its original state. Various technical experts and companies became involved, with Greg Kintz given the arduous challenge of matching the faded left-eye print with the right-eye elements provided by MGM. The presentation is basically flawless, with extremely impressive sharpness and bright, primary colors throughout, while the 1.66:1 framing is much more compositionally eye-pleasing. The 3-D itself is on one hand less aggressive than, say, The Charge at Feather River or, more recently, Comin’ at Ya! (1981), the fun, neo-spaghetti Western in which no 3-D splurge is left unexploited. At the same time, Gog uses 3-D in consistently interesting, sometimes innovative ways, taking advantage of depth modern 3-D movies, strangely, often don’t do at all. In Gog, for instance, many of the sets are deliberately layered closer to and farther away from the camera, rooms and compartments sometimes separated by glass and doorways. Seen flat Gog always looked unusual but not in the good sense. In 3-D, however, the set design is often striking. Further enhancing the Blu-ray is a superb Restoration Comparison that demonstrates just how challenging it was to bring Gog back to life; archival interviews from 2003 with director Herbert L. Strock and cinematographer Lothrop B. Worth, who sadly didn’t live to see this gorgeous restoration; and, best of all, an information-packed, typically humorous audio commentary by Tom Weaver, the go-to guy for such things. He apologizes up front for having less to say about Gog than his other commentary tracks for lack of existing archive documents but you’d never know that for its wealth of information. He’s joined by Bob Furmanek and David Schecter to discuss the film’s restoration and score, respectively. As other reviewers have pointed out, rights holders of other classic 3-D titles – Are you listening Wade Williams? – really need to seek out the 3-D Archive and its team of talented and devoted artisans and scholars in providing them access, through sub-licensing or other participation, to preserve these movies before it’s too late. Gog may not be Intolerance, Greed, The Magnificent Ambersons, Vertigo or Spartacus, but it’s an underrated, ambitious little film more than worth the effort to save it, and with this and other 3-D Blu-ray titles in which the 3-D Archive has been associated with, have more than demonstrated the stunning results with which they are capable.